As one of the UK's most reputable manufacturers and installers of prestige, high quality granite and quartz worktops, Mayfair Granite are one of the most trusted suppliers and fitters available to fit worktops in Birmingham. Delivering an impeccable service every time, our staff work extremely hard to cater to all your requirements to ensure that the quartz or granite fitted for you are tailored to your needs, offering a highly personable and expert approach. I never ever expected to be as thrilled as I was with getting a new kitchen and worktop. I’m a bloke, I like cars and beer, not kitchens, but the worktop you made is absolutely fantastic, I love it, it makes the room! The guys who came and fitted it were brilliant, I’d done my best to make it all level and smooth, but they spent hours fine tuning it and making sure it was perfect, I was genuinely really impressed with their attention to detail, you could tell that doing a perfect job meant a lot to them, So thanks again, really pleased, have recommended you to loads of people and will continue to do so. Can I say how pleased we are with the service we received from your company. We are delighted with the new granite worktops, the installation carried out by Danny and his team was superb! They worked efficiently and left the kitchen spotless, hardly pausing for tea. The whole experience from ordering to installation was exceptional. I want to say thank you for your excellent customer service, putting up with our delays and a special mention to Barber, who cheerfully sorted out some rather dodgy levels on our installed kitchen cupboards. It all looks great and I would recommend your company to anyone. Firstly, I would like to say thank you for the production and installation of my recent granite worktops, I am delighted with them. Special thanks to Damien and his colleague who templated and fitted the worktops, they were extremely helpful, efficient, a delight to deal with, a real credit to your company, sincere thanks! Thanks also to Michael; the service I received was excellent, an extremely personable and helpful chap a truly professional service. Please pass on my thanks to all involved, the turnaround from quote approval, to templating to final installation was very prompt, I am extremely pleased with the whole process and more importantly the final product. All of our workshops are UK based allowing us to provide an exceptional turnaround speed of approximately 5-7 days between the templating of your quartz or granite worktop to the fitting. Working closely with our templaters and fitters in Birmingham, we are able to maintain a personalised service, ensuring that you are 100% happy throughout the process. We also polish all worktops to a high grade, eliminating any grooves and imperfections. With flexible fitting hours, we are also able to agree a convenient fitting time for you. We ensure that the same templating stonemason is also the individual to fit the granite or quarts to ensure the finish is flawless and to your expectations. All our quartz and granite are sourced direct from the quarries which guarantees us the highest of quality materials, which has also enabled us to maintain a strong reputation for quality of service in installing granite worktops in Birmingham. 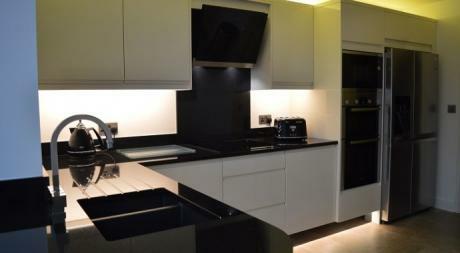 We also offer a fully comprehensive 10 year warranty on all of our granite to provide confidence to our customers. For further information on any of our granite and quartz available in the Birmingham area, please contact our sales team today on 0121 607 8895. If you are looking for an instant quotation, you can do so online on our website here - this is completely free and can be repeated with any desired surface.